Whether you need to spread fertilizer or seeds, the best drop spreader for the job will make the task simple and quick. Drop spreaders are super useful, simple but handy tools for your lawns, yards or gardens. These useful tools will help you spread seed or fertilizer as well as food for your yard pets quickly and easily. Best Drop Spreader – What to look for before purchase? Why do you need a drop spreader? Well, the key to having a beautiful lawn is proper planning. Starting from good seeds, you will need to add nutrients such as nitrogen, phosphorous, and potassium if you want your grass to grow healthy and strong. A drop spreader is one of the two most popular two types of lawn spreaders, the other being a broadcast spreader. While broadcast spreaders have the advantage of covering a larger area and are useful for bigger yards and lawns, they disperse the seeds or fertilizer the front and to both sides reaching different areas depending on the pace you walk at and the speed of the rotor. The end result? Although seemingly more convenient, broadcast spreaders are not as precise as drop spreaders. If you have used a broadcast spreader, you will have noticed that the area nearest to the spreader get the most fertilizer or seeds. The outer areas are not done evenly which might result in a problem of uneven grass lawns with patches of grass missed. 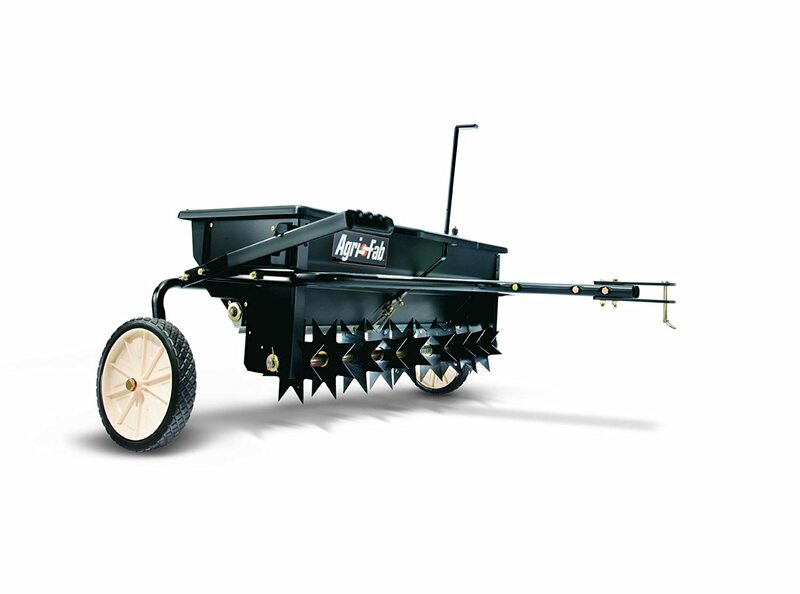 Drop spreaders are a more frequently used type of spreaders for planting seeds and lawn maintenance. They provide a more uniform spread of fertilizer or seeds then broadcast units. How come? Well, whatever you are spreading comes out of the hopper, through the bar slot and onto the ground, straight between the wheels of your drop spreader. All you need to do is make sure to check the width of the dropper. This is because the spread width is not really wheel to wheel. There are often a few inches on each side left unspread. That’s why you need to plan the spread width carefully when using your drop spreader. So the advantage of being more precise than other types of spreaders comes into play when you need to use your drop spreader to sow or fertilize the areas around your trees, shrubs, and around flower beds as well as patios. They are also perfect for jobs near the paths or property borders where precision is important. In addition, drop spreaders are not affected by the wind in the way broadcast spreaders are, which is yet another advantage. Any disadvantages? Well, there is one, actually. You might get stripes if you miss an area while pacing your lawn or yard. This is why you need to be careful and make sure that every inch of the target area is evenly spread. Anything else you can do to get an even spread? Try going over the areas more than once, preferably in the early morning. The dew on the grass will make the product more visible so you’ll be able to see if your spread is even and make another pass if needed to cover the areas you missed. Make sure you work it in straight, overlapping lines. Don't forget to use your best aerator for the much needed soil or lawn preparation for better growth! The best drop spreaders come as either walk-behind or tow-behind units. Walk-behind models are perfect for smaller lawns, tight spaces and home use. Tow-behind drop spreaders are perfect for larger lawns or yards and they are the best option for commercial use. Just hop on your yard tractor and spreading will be a breeze. The width varies from 22” to more than 40” depending on the model and the class. Smaller budget friendly drop spreaders for residential homeowners usually cover about 22” while bigger, sturdier and more heavy-duty spreaders have 30-40” or more spread width. Some hoppers feature dual side-by-side hoppers so you can choose single or dual spread width. Whichever the width, you will have to plan overlapping because of the area close to the wheels on both sides. As we said, this area does not get full coverage so overlapping by one-third of the path will do. The frame on most spreaders is quality powder coated steel. This is perfect for durability and long-lasting use. The hoppers come in sturdy and rust-proof poly or steel. They are coated to provide longevity but also to allow for convenient cleaning after different products including anything from seeds and fertilizers to mulch and rock salt. It's important that you use your drop spreader properly to make sure that the area you are spreading gets complete coverage. 1. Check the packaging of the product you will use for recommended spreader settings and adjust the setting dial accordingly. 2. Fill the hopper with the product while the spreader is disengaged. Add as much product as you think you'll need for the area of application. Don’t worry if you underfill the hopper because you can add more product if you run out of it. 3. Position your drop spreader near the edge of your yard and push the lever to engage it. Walk at your normal pace around the perimeter of your lawn to apply the product all along the edge. 4. Disengage the spreader and start the next pass at one end of your yard. Align the spreader with the wheel tracks of your initial pass and engage the spreader. Walk or tow from one end of the yard to the other in a straight line. 5. Disengage the spreader after each pass and reposition yourself to walk back to the other side. You need to use the wheel tracks from the previous pass to align the spreader in order to get even coverage. Engage the spreader again and walk back in a straight line. 6. Continue repositioning the spreader according to the previous wheel tracks and drop spread at an even pace until you've covered the whole area. 7. After returning the excess product back into the bag, you should rinse out the spreader with a garden hose to remove any leftovers. It’s a good idea to use a spray lubricant to oil any metal parts to prevent rusting. 8. Check the calibrator on the spreader to make sure that the calibration didn't shift during spreading. Take a look at the instruction manual which came with the spreader to determine the calibration method for your specific drop spreader. Scotts Turf Builder Classic Drop Spreader features a heavy-duty frame for optimum stability and is ideal choice for medium-sized areas that need precise application. This drop spreader from Scotts will do a great job in heavily landscaped areas or in tight spots around your raised beds, trees and bushes. This model guarantees the precision of application and durability at an affordable price. It drops various lawn and yard products between the wheels so that you have full control over exactly where the product falls. It has a solid capacity of covering up to 10,000 square feet. Scotts Turf Builder Classic Drop Spreader aims for a high-precision spread as its 22-inch drop spread pattern allows for maximum coverage and accuracy at the same time. You need to have in mind that the drop width is not exactly wheel to wheel. You need to measure the slot and make sure that you don’t leave stripes of product on your lawn instead of a uniform spread. The pace of your walking while pushing this drop spreader also plays an important role so it might take some practice until you get that perfect pace and achieve uniform coverage. Scotts Turf Builder Classic Drop Spreader comes pre-calibrated, fully assembled, and ready to use. The large capacity hopper is well-made and is easy to fill, empty and clean. Agri-Fab 175-Pound Max Tow Behind Drop Spreader is made of solid-quality materials and designed in the way to allow homeowners and landowners who need to drop seeds and fertilizer onto larger areas of land in a short time. With the maximum hopper capacity of 175 pounds, this unit can carry enough products (seeds, fertilizer, mulch or even rock salt) to spread over up to 40,000 square feet of land. Agri Fab 175-Pound Max Tow Behind Drop Spreader was designed to provide even coverage and simple operation. It comes from the company which specializes in producing good-quality tow-behind drop spreaders and this model is no exception when it comes to solid quality and ease of maintenance. For more durability, the spreader frame and the hopper on this model are made from corrosion-resistant and rust-proof materials. You will be able to use it for different products and expect this unit from Agri-Fab to last seasons on end. With its controlled spread width of 42 inches and easily accessible on/off controls, this tow behind spreader will help you cut down on the amount of time needed for spreading various products. One notable feature is the partition that divides the hopper in half. This will prevents materials from piling on the low end when it is being used on uneven or slanted areas of your land. This model offers durability, easy maneuverability, and great design. It’s built low to the ground, so that finer-grained products, like sand and lime, won't be lost to the wind. All you need to assemble this drop spreader is a wrench and the assembly instructions (well-written and included in the purchase) as well as patience. Its oversized hopper will allow you to haul enough seed or fertilizer to cover up to one acre of land and the overall quality make this tow-behind drop spreader from Agri-Fab a solid investment. P70-12010 Commercial Drop Spreader is a 36” commercial drop spreader from Spyker. This commercial-grade unit is ideal for spreading seed, fertilizer, and salt rock, depending on your needs. The Spyker P70-12010 Drop Spreader has two side-by-side hopper sections, allowing the operator to spread 18” or 36” widths. This guarantees even and consistent coverage around your landscaping spots or other tight areas. This model is a perfect solution for starting new lawns in the spring as it drops seed exactly where you want it. In winter, it can be used to apply ice melt to sidewalks and driveways all the way to the edge of the pavement without burning the grass or raising the PH of the soil. The large 13” x 5” fully pneumatic tires distribute weight evenly for smooth operation that won’t leave ruts. The spreader comes standard with variable rate and ½” fixed rate bottoms for more versatility. In addition to home and landowners, this commercial drop spreader from Spyker is a great piece of equipment for professionals working with huge commercial lawns, turfs, and golf courses. It features two side-by-side hoppers with a 120 pounds total capacity when filled completely. For a full 3' (36") wide coverage, you can fill both hoppers, but if you are spreading in narrow areas or around tight spots, only one hopper section can be filled for a smaller 1.5' (18") wide coverage. An excellent choice without a doubt! The Newer Spreader Model 200 is not much more expensive than the smaller 100 model and it does not take any more space to store. However, you will have the ability to load more manure or any other product. This unit comes standard with the 2" Ball Hitch attachment (the drop pin style hitch is standard) and also the Tarp Cover! These two extras save a chunk of money alone. The agitator is also standard equipment and, being made of Stainless steel, it guarantees added durability against corrosion. The 200 model is made of aluminum, it's has flat free tires and it's very easy and convenient to work with! It also features a split axle & drum assembly for added maneuverability and it can hold 13 cubic feet of any material or product you need to drop onto your soil or lawn. Tractor tread solid tires guarantee no more flat tires! The pressure treated lumber with NS logo branding is of solid quality and the whole unit is well-balanced, fully or partially loaded. The many happy owners swear New Spreader Model 200 is well-worth the price! Agri-Fab 175lb Drop Spreader / Spiker / Seeder unit weighs only 83 lb. and comes in 33 in. x 55 in. x 28 in. dimensions when fully assembled. The semi-pneumatic wheels are 10 in. x 1-5/8 in. They make this spreader/spiker/seeder highly maneuverable and allow for smooth transport and work. Now where this model really shines is the added spiker tool attachment which enables the much needed aeration at the same time. It’ll save you a lot of time AND money for not having to by a separate tool for aerating your lawn or garden soil. Spiker, seeder, drop spreaders offer the advantages of a drop spreader with the added benefits of a multi-purpose tool. They enable you to aerate your lawn allowing water, sunlight, and nutrients easy access to the grass roots. Well-suited for seeding, these quality and convenient units save you time by allowing a one pass aerating and fertilizing. A spreader and aerator combined into one attachment actually does double duty. It also saves you valuable space in your shed or garage. The combination design allows you to aerate and seed in one pass while the premium galvanized metal agitator improves durability. This quality drop spreader from a trusted manufacturer will not disappoint! 2 Best Drop Spreader – What to look for before purchase?